As the companion to two dogs and three cats, Beverly recognized that massage clients relaxed more when their dogs were present during their sessions. As a result she maintained a “dog friendly” practice. She soon began working with the canine athletes and their handlers. 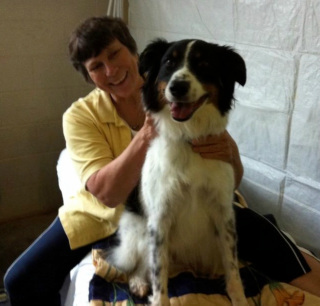 She was been working with dogs for the past fourteen years and travels throughout the Southeast, working at agility trials and other canine events. She has worked at the AKC National Agility Championships, the UKI US Open, and the USDAA Cynosport World Games. Her canine practice focuses on performance dogs who compete in athletic sports. She combines her love and respect for dogs with her extensive knowledge of anatomy, movement, and the understanding of the quality of muscular health to facilitate healing and well-being.